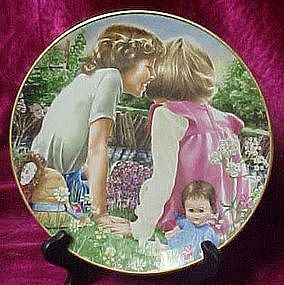 Limited edition plate titled "Sharing a secret" from artist Liz Moyes and the Danbury Mint. Plate made of fine Bavarian porcelain from the series, "magic moments of childhood". Plate is in perfect condition and measures 8 1/4" in diameter and has a nice gold edge trim. Sorry... no box or certificate. I have several from this series.